Kristina Duca of West Seattle was already an avid volunteer before she first came to the American Red Cross two-and-a-half years ago. Because she loves animals, she spends her Saturdays helping at the Seattle Animal Shelter and also volunteers at Bulldog Haven Northwest. That’s an organization that finds adoptive homes for English and French bulldogs. So what brought Kristina to the Red Cross? “It dawned on me that I wasn’t doing anything to help people,” she says. She had seen news articles describing how the Red Cross helps people at disaster scenes. “That sounded like something I could do,” she says. 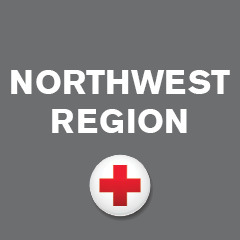 So Kristina became a Red Cross volunteer — a member of a Disaster Action Team (DAT) in the King County chapter in Seattle. She has been helping people ever since. During one recent action-filled week, Kristina and her DAT teammates responded to six fires and provided Red Cross assistance to several dozen disaster victims. It is Disaster Action Teams that provide Red Cross assistance at disaster scenes. There are six such teams in King County, working in rotation. Kristina’s team is on call one week out of every six, responding wherever the Red Cross is needed between 5 p.m. and 6 a.m. the following morning. When I talked to Kristina, she had just finished that super-busy week, and was hoping to make up for a lot of lost sleep. Most weeks when Kristina’s team is on call, it will respond once or twice, usually to house fires involving just a single family. “Some weeks we don’t have to respond at all,” she says. Her most recent week on call was anything but ordinary. Her first call was on a Friday night, to a fire in a 20-unit apartment house in SeaTac. The fire was big enough to be reported on by local television news. It began small, on a stovetop, but spread so rapidly that firefighters from the Puget Sound Regional Fire Authority had to call in a second alarm. There were no injuries in the fire, but Kristina’s team had to provide emergency housing for 20 residents of the building. Saturday brought two more fires, nearly back to back. One was in a four-unit apartment building and the other in a private home. Neither was on the scale of the Friday night fire, but the two fires kept Kristina on duty virtually the whole night. She responded to the first fire at 10 p.m. and was at the scene until 1 a.m. She had barely fallen asleep when the second call came in at 3 a.m.
Kristina’s team responded to three more fires before their on-call week finally ended. None were major fires, but they called the team away from home for at least part of each night. After all this time as a Red Cross volunteer, Kristina is used to the chaos and anguish she finds at fire scenes. “We are seeing people on what for many of them is the worst day of their lives,” she says. What she finds gratifying is the extent to which neighbors come together at fire scenes to help one another. She mentions residents of the SeaTac fire building who kept knocking on doors until they were sure everyone had been evacuated safely. She also talks about the youngster at the fire scene who was concerned about his pet bearded dragon while he was in emergency housing. “The building property manager was babysitting her grandson and it turned out the grandson also had a pet bearded dragon,” Kristina says. The two reptiles could be housed together until the boy was able to return home. Every Red Cross response leaves a memory or two behind. One of the week’s fires produced two brothers who were caring for their 102-year-old mother. Nor is the bearded dragon is the only offbeat pet Kristina has encountered as a Red Cross volunteer. She recalls an apartment fire in North Seattle where a firefighter appeared holding what Kristina calls “a wet and ticked-off snake.” The snake’s owner had not been home when the fire broke out. Responding to middle-of-the-night disasters is a long way from Kristina’s day job as a program manager for a Seattle digital marketing agency. She was an English literature major at the University of Washington, but her first out-of-school job was creating special events for the University’s law school.